We’d love your help. Let us know what’s wrong with this preview of Snow Fence Road by Phyllis Edgerly Ring. the kind only the miracle of new love can heal. Tormented by her fiancé’s death, Tess Johansen escapes to the only place that can still comfort her—the Spinnaker Inn in coastal Maine. Here in this place by the sea she feels close enough to the man she lost to numb the pain, if not the guilt. For local craftsman, Evan Marston, the ramshackle inn serves only as a grim reminder of the accident that shattered his life and killed the woman he once loved. But while the Spinnaker’s walls may hold guilt and grief and suspicion, they might also house a bright new spark. To ask other readers questions about Snow Fence Road, please sign up. 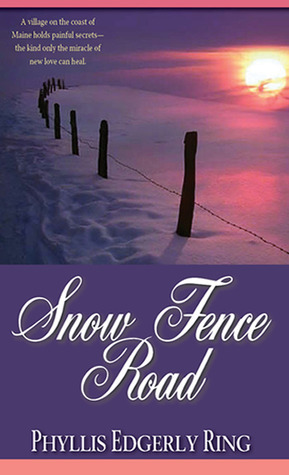 If you are looking for a touching romance novel to curl up with by a roaring fire during the winter holidays, then consider Snow Fence Road, a beautifully written, poignant love story about two lonely individuals who struggle to move beyond their painful, guilt-ridden past to find a second chance at love. I felt such empathy for both Evan and Tess who have each chosen the small village of Knowle, Maine, to find refuge and purpose after losing a significant other. When they officially meet the summer after Tess’s fiancé’s death, I could see such potential for them to find happiness together. Tess is a kind-hearted, compassionate woman who has decided to leave her nursing career and make a fresh start by becoming co-owner of the Spinnaker Inn, a place that holds fond memories for her and Andy, the man she planned to spend the rest of her life with. Unfortunately, the weight of her own guilt keeps her from truly moving forward even though she now works alongside Claire, a close family friend. Evan also has a close connection to Claire, and, in such a small town, it is inevitable they will meet. However, both have suffered so much emotionally that a blossoming romance between them is almost unimaginable. Inch by inch, though, they begin to take baby steps toward each other, becoming acquaintances, next friends, and then all that is left is to take the next big step into a solid, emotionally satisfying relationship. By this point, I have my fingers crossed that they will put the past behind them and embrace their burgeoning love that promises such hope. Evan is a man who has lived the past five years tortured by guilt over the circumstances of Celia’s death shortly before their marriage was to have taken place. Evan has never revealed the truth about what really happened on the seaside cliff that led to his fiancée’s death and his own crippling fall. Tess is initially conflicted about Evan, the gentle, handsome man who has captured her interest versus the type of man the media has portrayed him to be after the tragic accident. Fortunately, Tess is not the type of woman to form opinions based on hearsay, and as she gets to know Evan, she begins to see a kind, generous man who is capable of so much love if he can just let go of the pain and grief that consumes him. Inadvertently, Tess becomes involved in circumstances that push hidden and long buried secrets to the surface. The truths revealed are painfully shocking, but they have to be acknowledged and addressed by all parties involved before any real healing can take place. A central question in the story is whether Tess and Evan can make peace with their past and find the forgiveness they need to start a new life together. This is a sweet, clean well-written romance that will warm your heart and leave you with a smile by the end. I received a copy of this book from the author for a fair and honest review. From cover to cover this book will have you turning the pages as quickly as possible. Set in Spinnaker Inn, Maine - Tess Johansen is trying hard to recover from the pain of lost one. Evan on the other hand has a more chaotic past to deal with apart from the grief of his loss. From friendship to love, this is a fantastic journey all over again. After reading 'with thine own eyes' i was surprised to find such a wonderful romantic book from the same author. I really enjoyed this book and could reall From cover to cover this book will have you turning the pages as quickly as possible. Set in Spinnaker Inn, Maine - Tess Johansen is trying hard to recover from the pain of lost one. Evan on the other hand has a more chaotic past to deal with apart from the grief of his loss. From friendship to love, this is a fantastic journey all over again. After reading 'with thine own eyes' i was surprised to find such a wonderful romantic book from the same author. I really enjoyed this book and could really understand the pain that characters felt. New relationships are never easy. This was a moving story that many people find themselves facing at one time or other in their lives. When I started reading SNOW FENCE ROAD on my Kindle, I expected it to be a typical romance – and that would have been fine with me. I love a happy ending! But when the book opened with one of the main characters dressing to go to a funeral, I suspected the story would have much more to it than I’d anticipated. I was right. What impressed me is that the characters seemed so real. The back stories of both the hero (Ewan) and heroine (Tess) revealed the reasons behind their attitudes and situations When I started reading SNOW FENCE ROAD on my Kindle, I expected it to be a typical romance – and that would have been fine with me. I love a happy ending! But when the book opened with one of the main characters dressing to go to a funeral, I suspected the story would have much more to it than I’d anticipated. I was right. What impressed me is that the characters seemed so real. The back stories of both the hero (Ewan) and heroine (Tess) revealed the reasons behind their attitudes and situations when the story begins, and the histories of the older characters reflect the results of choices made in their youth. Times and social mores were different back then! Ms. Ring reveals all this in bits and pieces throughout the story, making me care more and more about the characters and causing me to read faster to find out what makes these people tick. The author also did an excellent job with her descriptions. The atmosphere of the small town in Maine where the story is set became real. The story takes place in winter, and the author moved her characters through that snowy landscape with skill. The harsh climate added even more drama to the story. As the story reached its climax, I thought about the damaging effects that guilt can produce. Ms. Ring solved her characters’ issues in the end with a very satisfying conclusion, which I enjoyed. I am also happy to say that the book was free of typographical and grammatical errors, which always makes for a more pleasant read. A delightful read, with brilliant flourishes. Hard to put down. It covers a lot of internal emotional space, as a good novel should, with deep insights and little clues left like breadcrumbs for you to follow throughout. I read it in one sitting and it held me in its grasp until literally the last page. The characters also deal with such universal challenges that the entire experience feels like a good therapy session. I don't want to spoil it for you, but lines like this are worth looking for: "
I don't want to spoil it for you, but lines like this are worth looking for: "She blinked up to meet his clear, sea-colored eyes. It was as though they reached all the way inside, helping her find her way back to the room", and, "It took a long time. When it came, it was long and hard and aching, far away, at first. It rose and fell, carried away and back again above the wind's roar like the tide. His inner ear drew it in, finally, following it, puzzling over it, till at last he knew the source." I love books with a great sense of place. Snow Fence Road has it all, the Spinnacker Inn where I would like to go for a holiday. The town of Knowles where you walk the streets with the charakters. Great food you taste while reading about it. Art you can visualize. Blueberry picking in summer and a long harsh winter that makes you shiver even when reading the book in warmer weather. Phyllis Ring describes a place in the heart we all want to visit and eventually live in. Where wounded souls can heal and find love again. Recommended to D.B. by: I received a copy of Snow Fence Road in exchange for a written book review. In the interest of full disclosure, I have to acknowledge that as genres go, I am not a Contemporary Romance writer or reader. However, disclosure aside, I have to say had I not read Snow Fence Road by Author Phyllis Edgerly Ring, it would have been my loss, on many levels. I believe a lot of writers have a more difficult time relaxing while they are reading than the average reader. Perhaps it is because as writers, whether we admit it or not, we are not pleasure reading - we are critiquing, com In the interest of full disclosure, I have to acknowledge that as genres go, I am not a Contemporary Romance writer or reader. However, disclosure aside, I have to say had I not read Snow Fence Road by Author Phyllis Edgerly Ring, it would have been my loss, on many levels. I believe a lot of writers have a more difficult time relaxing while they are reading than the average reader. Perhaps it is because as writers, whether we admit it or not, we are not pleasure reading - we are critiquing, comparing styles, looking for all the requisite elements that make a novel stand out from other like novels. Right or wrong, it’s much like editing a paper, and in the case of Snow Fence Road, Phyllis exceeded the grade. I often, without intent, pick things apart and revise novels in my head as I read, which is a distraction in and of itself, and this often takes the enjoyment out of reading for me. There have been times that I have put a book down and never returned to finish it because it had too many distractions. However, I never skipped a beat while I was reading Snow Fence Road. I enjoyed page after page and chapter after chapter. The story flowed as a story should from start to finish. Phyllis introduced us to her characters and their problems, which many of us can easily relate to, and she gave us just enough information at just the right time throughout her novel, which kept me wanting more. It takes a gifted author with an inborn talent to keep their reader's attention without effort. Phyllis did a phenomenal job at not showing her hand, which kept me full of anticipation and turning the pages. She built the story up through her characters’ pain, loss and suffering; however, she resolved the pain, loss, and suffering of her characters before masterfully concluding her story that ended in healing, hope, and love. This is what kept Snow Fence Road a realistic and relatable novel. My favorite part of this quote is, “This inner progressiveness of love between two human beings is a most marvelous thing, it cannot be found by looking for it or by passionately wishing for it. It is a sort of Divine accident.” To me, this is what Snow Fence Road personifies, "...a kind of Divine accident." I highly recommend Snow Fence Road by Phyllis Edgerly Ring, regardless of your preferred genre. If I were teaching writing, I would use this book to teach my students the elements of writing a successful novel. My blog does not have stars but this is a five-star novel. Read it. What a great book! A love story with a difference. A small town in Maine and delightful, Spinnaker Inn provide the perfect location and background for all the vicissitudes of a growing relationship fraught with difficulties. Phyllis Edgerly Ring generates such wonderful images. One can visualize so clearly the tiny village streets and feel the emotional tug of the charming old inn where much of the story unfolds. The characters are so real and finely drawn one is immediately pulled into their live What a great book! A love story with a difference. The characters are so real and finely drawn one is immediately pulled into their lives as though they were known to the reader. Tess Johansen, recovering and grieving from a lost love, Evan Marston, plagued by the memories of his own devastating relationship, are drawn together in an attraction neither of them had ever anticipated or expected. Despite this, their growing fascination for the other is hampered by the negative emotions of guilt, secrets and suspicions that block them from escape and seem to contain no resolution. As the story unfolds, the reader is invited into their lives where all this occurs and the author’s masterful touch provides the additional enjoyment of a sensual feast where one can almost smell the delicious odors that emanate from the Inn’s kitchen and taste the meals that are prepared and served there; one can almost feel the windblown spray from the ocean and warmth of a wood fire. The writing is lovely and the settings generate a perfect backdrop and sense of stability necessary to support the trauma that must be resolved. Snow Fence Road is a tender love story of two people, Tess Johansen and Evan Marston. Both have suffer the loss of a loved one, and together learn to break free of the guilt they kept buried deep within themselves. A few months after the death of her fiance, Andy, Tess moves to Knowle where she purchases the Spinnaker Inn. She runs it with the help of Claire, the original owner of the Inn. To keep her from thinking of Andy, Tess keeps herself busy cooking and doing small repairs at the Inn. He w Snow Fence Road is a tender love story of two people, Tess Johansen and Evan Marston. Both have suffer the loss of a loved one, and together learn to break free of the guilt they kept buried deep within themselves. A few months after the death of her fiance, Andy, Tess moves to Knowle where she purchases the Spinnaker Inn. She runs it with the help of Claire, the original owner of the Inn. To keep her from thinking of Andy, Tess keeps herself busy cooking and doing small repairs at the Inn. He was only 29 when he died, and she always believed he would beat his cancer. Andy’s death was a terrible blow to Tess. The death of Evan’s fiance, Celia is shrouded with mystery. Both he and Celia had fallen from a cliff. While Evan survived the fall, Celia did not. Rumors about the accident flew around the small town of Knowle, but Evan was never charged with any crime. He became a bit of a recluse after the accident. Only going out to work, he keeps to himself most of the time. Pain from his shattered leg and bad dreams are constant reminders of Celia’s death. Evan and Tess become friends and slowly begin to fall in love, something they never expected to happen to them again. When they finally give into their feelings and allow themselves to love again, ugly secrets come out and threaten to tear them apart. The mystery of what happened to Celia and why comes pouring out. Poor Tess is unknowingly put right in the middle of a touchy situation, leaving Evan upset and feeling betrayed. I enjoyed reading Snow Fence Road. I found it a reflective and poignant read. A more mature read, as apposed to the edgy new adult books I've been reading. The Spinnaker Inn is a quaint and cozy place to vacation near the coast of Maine. It has been around for decades and its familial history is just what Tess Johansen needs to heal her wounded heart. After suffering the devastating loss of her fiancé, she returns to the one place that still holds fond memories for her. As for Evan Marston, he avoids the inn and all of its memories, as he tries to cope with the daily life since his horrific accident. Slowly throughout the changing seasons, these two become friends who rely on each other and the inn to mend their broken souls. Snow Fence Road is a short, sweet and power-packing book. Readers will be riding an emotional rollercoaster, while turning each page as they try to figure out each twist and turn. One thing that the author focuses on is that tragedy, while devastating, could lead towards unanticipated opportunities. If this book were a little longer, the characters could have been fleshed out more. However the plot line is uplifting and the ending will leave readers’ astonished. The author of this book provided a copy in exchange for an honest review. I tend to read thrillers where the writer's aim is to grab you by the throat in the first chapter. This book certainly did grab my attention, but in a very different way. By a few chapters in it had quietly seeped into my bones and kept me enthralled throughout. It is a romance, with emphasis on love and trust rather than lust, but is so much more. The writer shows a deep understanding of the difficulty of fully opening up and becoming vulnerable and the pain of letting go of An absolute delight. It is a romance, with emphasis on love and trust rather than lust, but is so much more. The writer shows a deep understanding of the difficulty of fully opening up and becoming vulnerable and the pain of letting go of the past. The love interest is between a couple who have lost their previous partners through death and both battle feelings of intense guilt. The characterisations are excellent, two flawed but likeable characters who deserve a second chance despite their own misgivings. The setting is a small village on the coast of Maine. The supporting characters are intriguing and it is their past that breathes mystery into the story. The writing is to a high standard and while clear and concise maintaining a good pace there is also some beautiful imagery and a lovely rhythm to the writing. Is it possible to heal after the tragic loss of a loved one? Is it possible to ever love again? Tess and Evan are each struggling in their own ways with the challenge of healing their abilities to love and live a productive and thriving existence. In the small New England village in which they both find themselves, new circumstances and paradigms present unexpected and even unwanted opportunities for growth, healing and love. Surrounded by friends who support them, they discover more and more a Is it possible to heal after the tragic loss of a loved one? Is it possible to ever love again? Tess and Evan are each struggling in their own ways with the challenge of healing their abilities to love and live a productive and thriving existence. In the small New England village in which they both find themselves, new circumstances and paradigms present unexpected and even unwanted opportunities for growth, healing and love. Surrounded by friends who support them, they discover more and more about the unexpected attraction that pulls them into each other's lives. Eventually they learn that it is indeed possible to be there for each other in spite of the feelings of guilt, shame and pain that still haunt them. I loved this book by Phyllis Edgerly Ring, and will, I'm sure reread it again and again! The author describes the inner reflection of each of the two main characters, as they grow in their knowledge and infatuation with one another in a wonderful knowing intuitive way! I have to say that SNOW FENCE ROAD is a far cry from the first book of this author that i read, MUNICH GIRL. She took a sidestep from history and plunged herself into a story that involves love, hope, a bit of sadness and BEST of all takes place in my home area of New England. A simple story. One that does a heart good. Overall a book in which the reader wishes they could immerse themselves. Literally. Touche' Phyllis......you did it again!
" Use your heart's ears.listen to hear from the inside o I have to say that SNOW FENCE ROAD is a far cry from the first book of this author that i read, MUNICH GIRL. She took a sidestep from history and plunged herself into a story that involves love, hope, a bit of sadness and BEST of all takes place in my home area of New England. A simple story. One that does a heart good. Overall a book in which the reader wishes they could immerse themselves. Literally. When I won this book Snow Fence Road by Phyllis E Ring. I was kind of leery about reading it as I'm not big on romance type stories. I had entered to win it so that I could try and broaden my reading likes. I was very surprised that I really enjoyed it. It is a story about 2 people who gave up on love because they were each lost in the pain of loosing a loved one. They learned to deal with the pain and come to terms with the issues that they had and finally found each other. Makes you think that When I won this book Snow Fence Road by Phyllis E Ring. I was kind of leery about reading it as I'm not big on romance type stories. I had entered to win it so that I could try and broaden my reading likes. Makes you think that sometimes good things can come out of something bad. Keep up the good work Ms Ring. I read this book critically through the lens of a writer and by page 3-I was irreversibly tangled in the day to day lives of the characters. I found myself thinking about them through the day wondering of their fate. Ms. Ring weaves quite a tale right from the first page and keeps you guessing until the last. Don't let the summer months pass without taking this book along wherever you may wander. Well written and a pure delight. I was truly sad when I came to the last page. A friend recommended Snow Fence Road, and I picked it up on a whim. The cover is lovely ~ with a picture of a snowy road that just begs you to enter. Both of the main characters are dealing with losses, and every character in the book is so detailed that you feel you KNOW these people. It's the kind of story you hate to have end. It's based in New England and I wish that Tess was a friend of mine. I hope that Phyllis Ring considers a follow up to this book! I finished this book at least a month ago, and I am still fantasizing about taking a trip up to visit Tess and Evan. They have become family to me in my mind. Each character in this book is so unbelievably real, endearing, and heart warming. It was an absolute pleasure to read, even more so that the characters were admirable but realistically imperfect. I couldn't put it down and was genuinely sad when it ended. Please, please let there be a sequel! I enjoyed this clean romance, although the romance was very mild and rather old-fashioned. Reminded me a bit of romance books of the 60s and 70s era. The characters didn't get on my nerves, which seems to happen more often than not with more modern romance books. Clean, but enough colorful language that I wouldn't recommend to my mom. This is an amazing love story, on how two broken hearts can heal even when they thought everything was lost. Review coming soon to Brooke Blogs! Really good story about two hurting people and the love that healed them. This was a really good book...and I loved that it took place in Maine! Loved it, I was hooked from the beginning! It's a Wonderful Book! I love the written word, creative expression, travel -- and most of all -- the noblest possibilities in the human heart. I'm always curious to discover how history, culture, relationship, spirituality and the natural world influence us and point the way for our human family on its shared journey. I've worked as writer, editor, nurse, tour guide, program director at a Baha’i conference center, taugh I love the written word, creative expression, travel -- and most of all -- the noblest possibilities in the human heart. I'm always curious to discover how history, culture, relationship, spirituality and the natural world influence us and point the way for our human family on its shared journey. I've worked as writer, editor, nurse, tour guide, program director at a Baha’i conference center, taught English to kindergartners in China, and served as instructor for the Long Ridge Writer’s Group. I've written for dozens of magazines, including Christian Science Monitor, Ms., and Writer’s Digest, and worked as editor for several publications. My nonfiction books explore how to create balance between the spiritual and material requirements of our life. I write fiction because, like so much of art, it can help us discover just what shape this balance is taking within our own lives, and where that is leading our heart.